Welcome everyone to THE EARFUL, a delicious piece of extra content from the minds over at the OH NO RADIO SHOW. This bonus show features a countdown of songs we have been enjoying within our ONRS community giving you all a taste of musical variety and maybe even turning you onto to something you'll like! 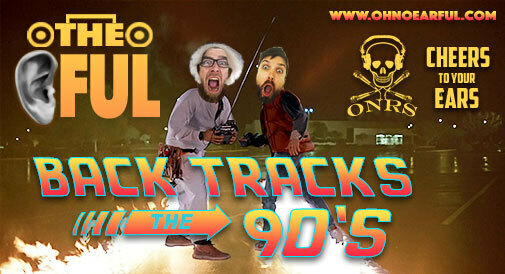 On this VERY SPECIAL EPISODE we decided to shake things up a little bit, hop in our time machine and travel back to the 90's in are very first EARFUL BACK TRACKS! So toss aside the Mmmmbops, ditch the Spice Girls and loose your Chumbawumba, we're gonna show you a whole new 90's bag - ENJOY! One of the BEST Live DJ sets of the 90’s hands down. Incredible album start to finish. Freestyle Fellowship is an American hip hop group from Los Angeles, California. It consists of Aceyalone, Myka 9, P.E.A.C.E., and Self Jupiter. They are part of the Project Blowed collective. Chris Joss is a French multi-instrumentalist and record producer. In the vein of David Holmes with the acid jazz, lounge explosion of Ocean’s Eleven and such. Pop-Rock band from Atlanta, Georgia. Pop group from San Diego California - Played all on an Option - “The Optigan was a kind of home organ made by the Optigan Corporation, a subsidiary of Mattel, in the early '70s,” says Pea Hicks of the obscure instrument around which his band Optiganally Yours revolves. Stereolab are an English-French avant-pop band formed in 1990 in London. Moxy Früvous was a politically satirical folk-pop band from Thornhill, Ontario, Canada. This entry was posted on Monday, June 12th, 2017 at 7:49 pm	and is filed under DefaultTag.